How do we set up an integration between Education Perfect and Canvas? Adding support for Canvas is a straightforward process, which normally requires a couple of hours of work by your school's IT team/LMS manager. Education Perfect's integration may differ from other integrations your school has, because we need a way to match a Canvas user to their EP account. This enables us to include the work they do in Canvas in their learning record when teachers are writing reports and running parent/teacher interviews. To get started, send us an email on support@educationperfect.com. If you're not the person who will be configuring the integration, please also include them in the email so we know who to contact with next steps. Our team will send you a consumer and secret key pair which you can use to authenticate with us. To check that your keys are working correctly, we've developed a test page which can be added immediately. This page also provides us with valuable information as we progress with the integration. Install the test page ( https://sso.educationperfect.com/Content/lti.testpage.educationperfect.com.xml) as a new App. In the configuration process, remember to include the Consumer Key and Shared Secret we give you. If you get a 405 (Method Not Allowed) error, this is normally caused by configuring the app manually instead of by URL. For more information, see How do I resolve a 405 (Method Not Allowed) error when configuring a Canvas integration? 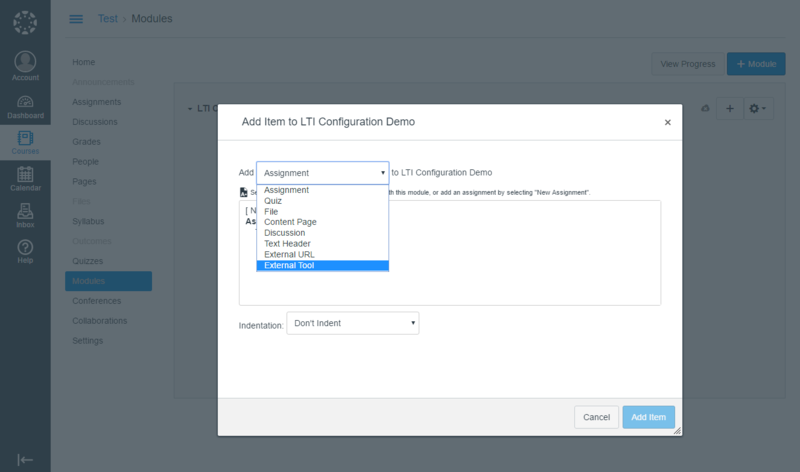 Now that the test page is available in Canvas, add a module in one of your courses, then select External Tool from the dropdown as the Item Type. Click Education Perfect TEST Page. Below is an example of the information that will be displayed. Copy all of the information on the page and send it to us - this page contains the information we need to continue the integration. If your students have already been using Education Perfect without a Canvas integration, their EP accounts will need to be linked to the unique identifier Canvas uses to confirm their identity. This enables any work that students do on Education Perfect in Canvas to be stored against their account. Often this is the user's school email address, but it can differ from school to school - the information in the test page above helps us to work out exactly what to use. If we already have the unique identifier associated with teachers' and students' accounts, for example because it's their email addresses, we'll match up everyone we can on your behalf. We will then send you a list of anyone we couldn't match. Once you send us the details for those people, we'll update them as well. Once all students and staff have been successfully set up with their identifiers, you can install the live integration in the same way as you added the test integration. The setup URL is https://sso.educationperfect.com/Content/lti.educationperfect.com.xml. Once this is done, your staff will be able to embed content into Canvas modules and courses for your students to complete.